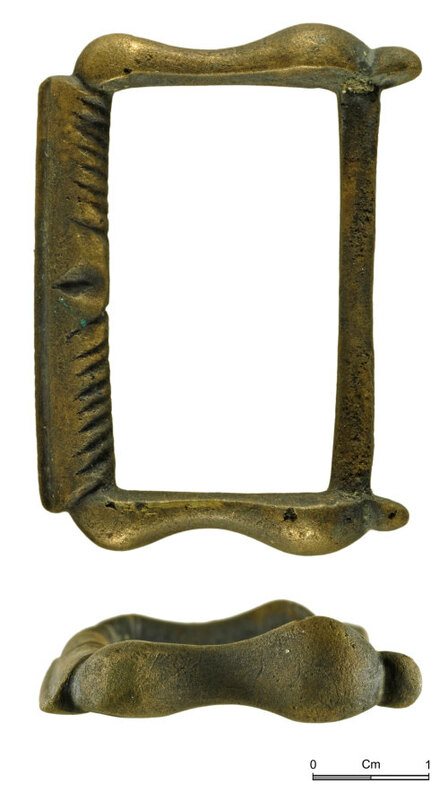 The cast buckle frame is of rectangular form (33.7mm long, 46.1mm wide and weighing 18.7g) and is complete except for the pin. The integral outside edge resembles a roller and is decorated with diagonal notches either side of a central notch for the pin. The underside of the outside edge is bevelled. The sides have two rounded lobes, with a larger lobe near the bar (9mm deep and 5.4mm thick). The bar is offset and narrowed. The surface is unpatinated, tarnished 'bronze'.